There is a quiet revolution in energy production that will change the lives of many: the solar energy revolution. With the cost of photovoltaic solar systems dropping rapidly, there has been a rapid expansion of solar power installations, both commercial and residential, around the U.S., with particularly rapid growth in California. 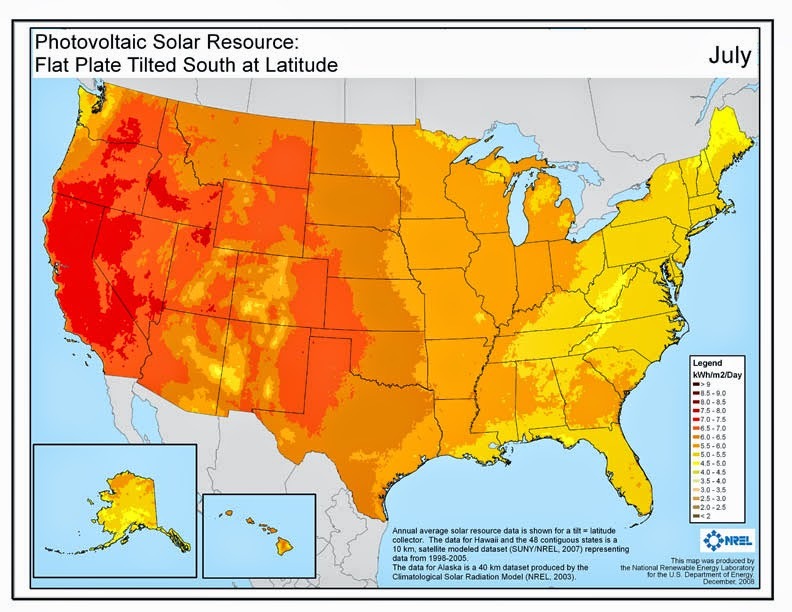 Consider the geographical distribution of the resource: where are the best locations in the U.S. for solar power? 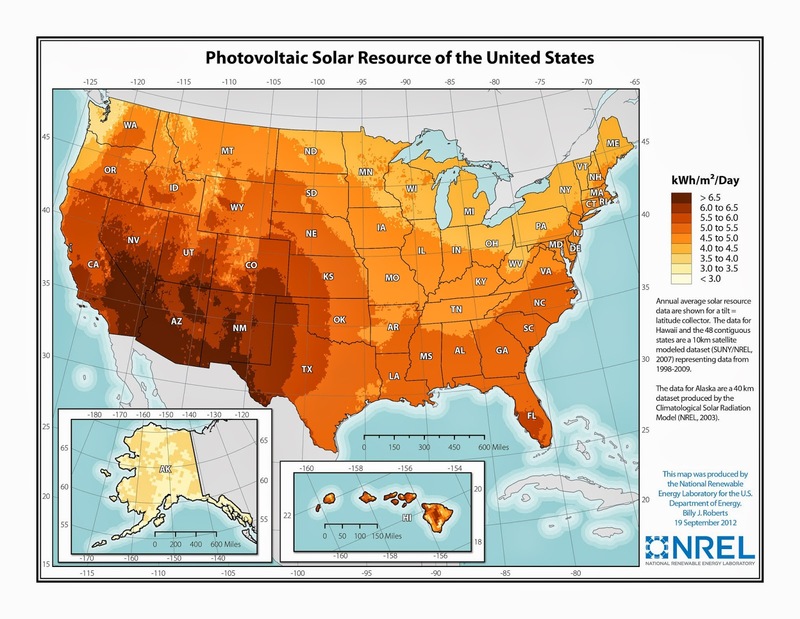 By considering both solar angle, cloudiness, and other factors, NREL (National Renewable Energy Lab) has produced solar energy resource maps for the U.S. Here is the annual average values (per day in kilowatt hours per square meter). The southwest U.S. is the Saudi Arabia of solar energy, with the highest values stretching from western Texas to California. It is really better than Saudi Arabia, since there is huge population hungry for energy in the Southwest (e.g., Los Angeles, San Diego, Las Vegas, Phoenix, Tucson, etc.) Lots of sun during the day, exactly when folks need it for air conditioning and their daily lives. For us here in the Northwest, there is substantial solar energy potential over eastern Washington and Oregon. This is particularly true during the summer months when our region enjoys clear skies and LONG summer days. To illustrate, here is the solar resource for July. 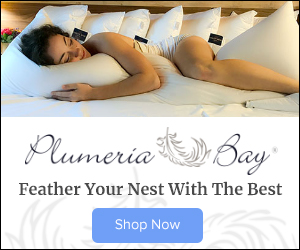 The Columbia Basin is world class, as good as California. desert southwest works against solar cell efficiency. But cooler temperatures makes our solar panels more efficient, partially leveling the playing field for us a bit. The amount of solar energy being produced today is far greater than many people think, particularly in California, the U.S. state with the most installed solar units. Here is a plot of the renewable energy output for California yesterday (April 16, 2015). 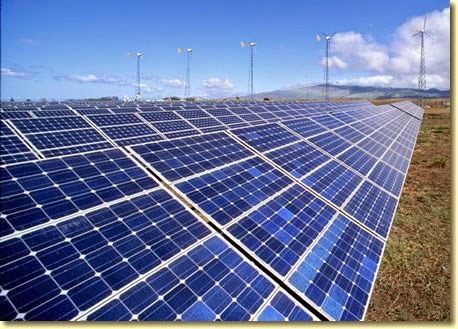 Solar energy is the dominant source of renewable energy during the daytime hours. But here is the amazing thing. The next plot shows total energy production yesterday in CA from all sources. Renewables (mainly solar) are roughly 25% of the total energy production during the day--and this does not include solar production at individual homes! But what about here in cloudy Seattle? It turns out that solar energy from photovoltaics can make sense for local residents, particularly with all the Federal, State, and local subsidies. One of the faculty members in my department installed a solar system two years ago. He finds that for the sunny six months of the year be pays nothing for electricity AND produces enough juice to charge his Chevy Volt for all his local driving. His estimated payback period is 7 years. Even without subsidies his solar array would make financial sense. Electric cars are a perfect adjunct to solar energy, allowing excessive power to be stored in the car's batteries for transportation and other uses. 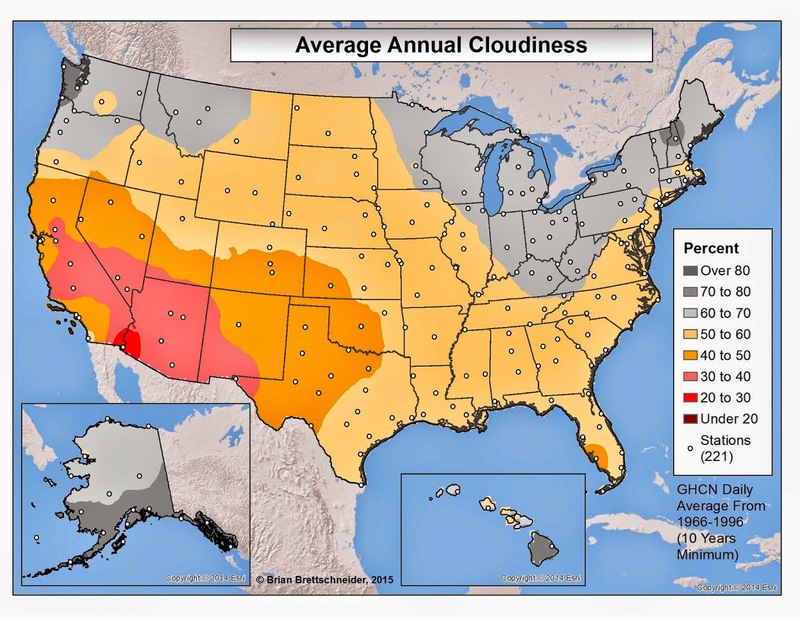 Warm climates like the U.S. Southwest are also good since energy demand (for air conditioning) is closely related to solar output. The U.S. is hardly tapping it potential for solar energy, and with supportive policies U.S. solar generation could easily be 10 times larger than today in ten years, supplying 10-15% of all U.S. electricity demand, and much more in the solar rich regions like the southwest U.S. These are conservative numbers--I bet we could do much better. In short, solar energy collection is growing rapidly today, but is only a shadow of what it could be, particularly since prices are dropping rapidly and the technology is progressively improving. Lately been measuring 600 watt/meter squared on my new weather station. The solar energy is definetly available to capture in our neighborhood. Maybe its time to look at that investment. As long as the solar units could be installed in roads, like that company from Sandpoint,ID is trying to do, it would be a huge win for renewables. I live in E.WA and while I support renewables, I certainly do not support public property being "taken" for is implementation. A lot of locals would support road bed solar over massive white windmills! Thanks for the post. I suspect that current prices are going to benefit the third world as much as cell phones, almost life changing. I lived in an area not just off the grid, but with no grid. Here is what solar would have done: 75 watts for a small fridge, 5- 20 watts for LEDs, and a small battery for nights for these. Another 100 - 200 watts to charge cell phones and computers, and a small TV (although I suspect people would sacrifice to have a much larger TV, and buy more batteries). I installed 30 3x5' solar panels made in WA state last July on my house here in Normandy Park. Its BEYOND a great deal. 1) you get .54$ a KW back, that is huge and it amounts to a lump sum payment of around 4500$ at the end of the year. 2) You get 30% tax back of the cost of the system for the first year. that was over 11,000$ back in our tax return just for the solar panels. 3) The finance the ENTIRE thing, so we are actually well ahead in what we have actually paid out. 4) Like CLIFF said , the cool temps make the panels more efficient and we are going to get about 600$ back in just the month of April alone from the .54$ per KW deal. 5) We pay nothing for 6 months of the year except the 8.40$ service fee from Puget Sound Energy, and in the winter our bill has been cut in half, yes even in the winter. 6) You bank what you dont use! so we had most of October electricity paid before we even started the month. The break even timeline is just about 4.5 years. Its a complete no brainer and after th 4.5 years we will be making quit a bit of money from the panels. Michael, who installed the panels for you? 1) More community solar projects, because many people's roofs are shaded or not oriented well. 2) More home DC devices, especially for lighting, because solar panels, batteries, and LEDs are all DC devices. Long ago, when I was in grad school, the story was the Suomi was going to do this on his house, but (perhaps this is apocryphal) he ran the numbers a found that it was actually more cost-effective to invest the money for purchase/installation in the local Power Company and use the dividends to pay for the energy. I'm inclined to think things have improved cost-benefit wise in the intervening 30 (sigh) years. There is a company in Maryland that will install the system for you and assume all risk, but you have to buy the energy back from them. It still saves you money. I think the buy-back time-frame is something like 20 years. Assuming the risk is important in regions where, for example, hail might fall or high winds are a threat. Michael Snyder makes what sounds like a compelling case for installing solar panels. Compelling for him but not for the taxpayers that are footing him the $11,000 tax credit. Compelling for him but not for the users that are paying him $0.54/KWh for electricity when the wholesale cost in the Northwest (January 2015) was about 2.5 cents per KWh. Next time I make a good busness decision, Ill be sure make sure its a good deal for Joe Tax payer. Pave paradise and put up a solar lot! Missing is any discussion of changing the albedo, shading ecosystems (one thermal plant tends to fry birds - maybe add windmills and get falcon McNuggets?). Or the other environmental impacts. If going solar is net worse than the coal trains, ought we do it? Also we don't see the dirty business of creating the solar panels and Lithium batteries and the rest. Stripmine coal in the USA - bad. Stripmine Lithium and destroy native people's lands - well, lets not discuss that. The cheap panels are like the $40/bbl oil - a temporary economic hiccup. Worse, it is creating local Solyndras and A123s. It may or may not make economic sense. Solar also needs storage - pushing all that to the grid still means there has to be some other technology backing it up - in Germany, the recent solar eclipse caused a 20% drop in solar output. LFTR (Liquid Flouride Thorium Reactor) and other nuclear has a small footprint, (inherently safe, doesn't produce fuel for bombs) and no carbon, but we can't do that! I don't know why. Somehow "science" is thrown out when it comes to actual cost-benefit analysis. Even solar has an environmental impact, and maybe there are destructive "hockey sticks" worth checking. 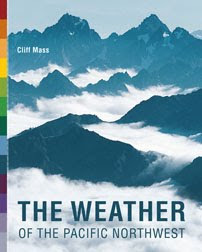 It is hard to take climate scientists seriously when they aren't even going to bother calculating the impact of paving vast swaths of land with solar cells which might raise local temperatures and destroy ecosystems and endanger species far more than whatever the random number picked for the temperature in 2121 might be. Cliff- thank you for posting this valuable information. Solar absolutely works in wet Western Washington. I work at itek Energy. We manufacture solar PV modules here in Bellingham. Our customers -solar installers- are going gang-busters in installations. For more proof that our cloudy region can accommodate solar take a look at a comparison of China's solar irradiance on a map from NREL. http://en.openei.org/wiki/File:NREL-china40kmdir.pdf China is a world leader in solar installations and yet has some of the worst irradiance - most likely due to pollution. The efficiency of solar pv relies on a combination of the sun, temperatures, tilt of earth, and altitude. So simply having a lot of sunshine is not a requirement. Most people don't realize this. Thanks for your article! (Commenting on the right blog post this time) The only thing stopping me from installing roof solar panels is my HOA CCRs. The FCC rules for broadcast TV antennas trump CCRs where you can install an antenna of any size or location necessary to receive broadcast TV signal. Perhaps we need a similar DOE regulation to allow for roof solar panels? Bring it on! The sooner the better. Judith Curry has an interesting and informative post related to this topic. The subsidized approach [to charging for grid services] was acceptable when roof top solar made up a small portion of the customer base. The inequity could be ignored because supporting fledgling renewables did not cost other customers much and was seen as desirable or not worth the trouble to fix. This approach will cause problems with higher penetrations of intermittent renewables. I have has a 1.23kW array on my house in Bremerton for the past six years installed by Power Trip Corporation, and these six panels have made 83% of my electricity since! I love them! The solution rises every morning! There are basic reasons conventional nuclear is dead safety safety and safety. I really like that there is a solar energy revolution that is going on to help people with saving energy. That is a good thing and plus the cost for them are going down too. That is going to help out a lot of people and change the way that we do things. Can't wait to see where things go and how advance it will become. India is very suitable for adopting solar power on mass scale as the country receives almost 300-325 days of direct sunlight. Indian government is also promoting solar energy heavily and coming 5-10 years are going to witness a major shift in the energy generation and consumption pattern for Indians. what can i use as a electricity alternative? What do people use solar power for? Qiute interesting article.. A photovoltaic system typically includes a panel or an array of solar modules, a solar inverter, and sometimes a battery and/or solar tracker and interconnection wiring. Perth Solar Power is an Australian owned and operated company dealing in renewable energy products and installations solar power in Perth for all commercial and industrial purposes. Our renewable energy products offer turnkey solutions. Is a Strong El Nino FINALLY coming?